Such was the solemn warning of Joel Hawes in his Lectures to Young Men, on the Formation of Character (1829). It is characteristic of 19th-century Britain that, even when someone wanted to warn against reading, he would do so by publishing a book. Reading was dangerous because it was powerful—and therefore, if the books were edifying, reading could also be a strong weapon for good. The Victorian age was the great age of reading. In 1815, 58 percent of men and 81 percent of women were illiterate. By the end of the century, however, 95 percent of both men and women were literate. On Sundays the Victorian masses often learned to read through the free schooling provided by local churches. State education was enacted in 1870—pushing literacy rates higher. Victorians often came to faith by reading. In the past, printed material had been too expensive for the poor. Now, the Religious Tract Society flooded the nation with cheap, edifying literature. Salvation how-to manuals were widely disseminated and highly effective. Newman Hall’s Come to Jesus reached a circulation of four million copies. J. A. James, author of The Anxious Inquirer After Salvation Directed and Encouraged, received a letter from one locality where 27 people had been converted through the circulation of a single copy of his book. The Victorians also lost their faith through reading. “Infidel” literature was also printed in cheap editions in order to reach the working classes. New fields of learning sometimes seemed to undercut traditional religious beliefs. Charles Darwin’s On the Origin of the Species (1859) sat uneasily with the Christian understanding that human beings were unique creations made in the image of God. The Darwinian scientist T. H. Huxley, invented a whole new category of doubters when he coined the word agnosticism in 1869. J. W. Colenso, missionary bishop of Natal, was overcome with doubts when his Zulu assistant asked him whether or not the story of Noah’s ark was really true. Colenso went on to write The Pentateuch and the Book of Joshua Critically Examined—an attack on the historical veracity of Scripture that caused a sensation in Britain. And so it went on. Victorians also read their way toward modifications of traditional doctrines. Some Victorians began to find certain Christian dogmas deeply troubling. The humanitarian strain of Romanticism made it harder to accept innocent or extreme suffering as part of God’s plan. For some, substitutionary atonement sounded like an unpleasant, if not positively immoral, idea. Notions of the Atonement become progressively vaguer. Leading Anglicans began to speak of Christianity as “the religion of the Incarnation,” and one book allowed this popular doctrine to subsume the category of atonement altogether: D. W. Simon’s Reconciliation by Incarnation. The Victorians made the feast of the Incarnation, Christmas, into the dominant cultural event that it has continued to be. Even more troubling than the older doctrine of the Atonement was the traditional view of hell. Colenso refused to believe that the Zulu people had been going to hell in mass for generations. Even for those who clearly deserved to be punished, endless torment seemed excessive and therefore inhumane. Ideas of “conditional immortality” or eventual annihilation began to rival the older view. And they read novels. The Victorians made the novel into the pervasive genre of literature that it has been ever since. Moreover, in an age without electronic media, the novel had an unrivalled place as a riveting art form. For many poor people, reading was a valuable gift not taken for granted. They saved precious pennies to spend them on books. The elite, despite their wider cultural opportunities, were enthralled as well. The statesman W. E. Gladstone cancelled his plans to go to the theater because he could not put down Wilkie Collins’ sensational novel, The Woman in White. Some people denounced novels as capable of inducing madness, but other cherished them as highways to truth, knowledge, and the realm of the imagination. The novel was a forum for discussing all the leading issues and concerns of a changing society and an ideal medium for those who wanted to influence people. Mary Ann Evans, after she became a skeptic, embarked on a triumphant career as a novelist under the pseudonym George Eliot. For her, the old faith was gone, but her novels could help people understand that “duty” still remained. A whole subgenre, “Condition of England” novels, arose to aid reflection upon the plight of the working classes and the problems of industrialization. The clergyman Charles Kingsley, who was deeply concerned about social problems, took to novel writing to address these issues. Even the Conservative statesman Benjamin Disraeli wrote some “condition of England” novels. Although most of Ward’s readers might have been worried about the “loss of faith,” they were not actually experiencing it. Christianity was strong, vital, and pervasive throughout the Victorian era, all its many challenges notwithstanding. Church-going was high. The urban poor did not often attend on a weekly basis, but they were still apt to be believers, and to connect with the church in other ways, such as celebrating rites of passage and sending their children to Sunday school. Most people found a way to think about biblical criticism, Darwinism, and other unsettling issues without losing their religion. Moreover, some who were temporarily thrown into doubt read their way back to faith once again, including the political reformer Thomas Cooper. Having at first lost his faith after reading Evans’s translation of Strauss, he later wrote a popular refutation of Strauss, The Bridge of History over the Gulf of Time. Timothy Larsen is associate professor of theology at Wheaton College. 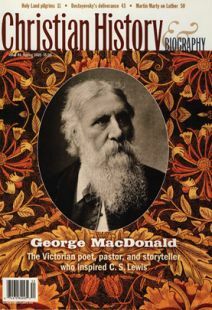 Interesting and unusual facts about George MacDonald. George MacDonald’s sermons passed the Victorian tests of earnestness and practicality with flying colors. First church of Norway, Da Vinci’s fingerprint, and the cradle of Scottish Christianity. With the pen as his pulpit, George MacDonald used fiction to show the relevance of scriptural truth to the problems of his age.